My visit has taught me humility! Remember I was boastful about adding the photos from my phone to my laptop? Well for my sins, I lost half of them this time. 🙁 The window above was the only survivor! Formerly St Mary’s Church of Ireland, it was built at the beginning of the 18th century and an early example of a galleried church with a Renatus Harris built organ. St Mary’s closed for worship in 1964. Finally this ‘List 1’ building was purchased by John Keating it was extensively and sympathetically restored over a seven year period. 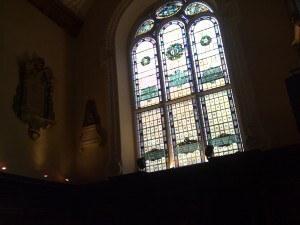 The present owners renamed it The Church and it is a must visit for any trip to Dublin. Sean O’Casey playwright and author of ‘The Plough & The Stars’, ‘Juno & The Paycock’ and Shadow of a Gunman’ was baptised there in 1880. John Wesley founder of the Methodist Church delivered his first Irish sermon there in 1747. Handel‘s Messiah was first performed in Dublin in April 1742 and he regularly used the Renatus Harris built organ to practice! Have you ever noticed how the voices in the next room always seem to be having more fun? Of course, if you are having fun where you are, the voices in the next room never register. “…. we decided to run another Blogger-Twitter-Whatever (BTW) meetup”. I added faces to many names and met new people. I talked, listened, laughed and I learned how to play with an iPad! People gave me contact details on business cards, One guy apologised while handing me a sheet of paper. Right in the centre of the page was what looked like a puzzle. Elly who was hovering on the periphery, as she always does when I chat up the Toyboys, began to laugh out loud and said “Mum show Jamie your ‘southern mobile phone’. Ever the good mother, I produced the phone and the whole circle of people burst out laughing’. Why were they laughing at me? Since my normal mobile phone is from the UK and while in the South the calls are charged at an international rate, I keep this old phone with a pay-as-you-go SIM card for all local calls and text messaging. Jamie’s piece of paper had what looked like a chopped up and randomly pieced together bar code. Bar codes I am familiar with. 690.691.692 until 695 are all MADE IN CHINA. BUT, and there was a big But; Jamie’s puzzle was a QR Code. It was the first I had come across and since I did not have a smartphone, I was unable to read the matrix barcode! You see I might be good for a laugh… but I learned something on Thursday. Thank you Jason for organising the BTW and Hi to all the guys and gals that I met! I am already looking forward to the next one! This entry was posted in Friends, Meetings on July 31, 2010 by Grannymar. Great post. I’m interested to see how that Church has been reincarnated. I’ll definitely check it out whenever I get home. Gaelikaa – I have been there a few times and always enjoyed it. I can’t help but wonder what John Wesley would think of naming a bar ‘Church’ since he thought drinking was a sin. I’ll bet his congregation was small in Ireland, the land of Guiness. It looks like you all had so much fun. Life is so dull here that I am envious. I wish we did blogger meet ups. Must check out a fewmore Aussies. Mine all seem to be miles away. Glad you had a good time and it seems ridiculous that IR calls are charged at an international rate,what a scam. A bar can be called a church, a temple or a pagoda, and there are many with such names on a stand alone basis or in combination with somethig like the city’s name or the owner’s etc. I am a teetotaler but will break my abstinence if someone will take me to a bar called The Mosque. Darlene – The latest figures I can find for Methodists (2007) were 53,668 members for the whole of Ireland, North and South. 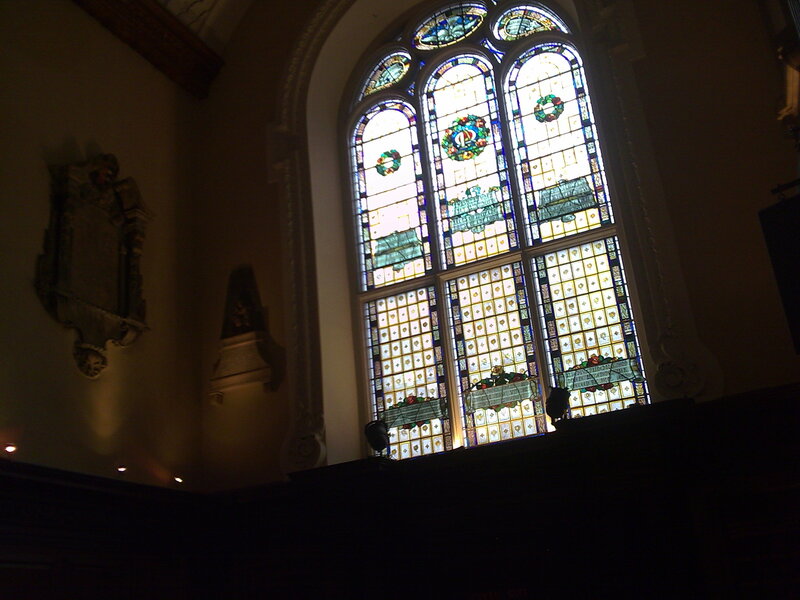 John Wesley was a guest speaker at St Mary’s, in 1747, and the church was not founded here until 1784. Baino – My phone network is UK based and it charges me the international rate for calls I make while ‘abroad’ – their term. Since I seem to make more calls while down south it is sensible to carry an extra phone. Ramana – I think you might have a long wait and wild thirst by then.